Since my last little project was a success in terms of getting the test board to work. I have now come back with some good news I have been slaving away on a hot monkey brain to get the new design that I have been working on out the door to show to the good folks of this forum on what I have created and to get some feedback on the design. 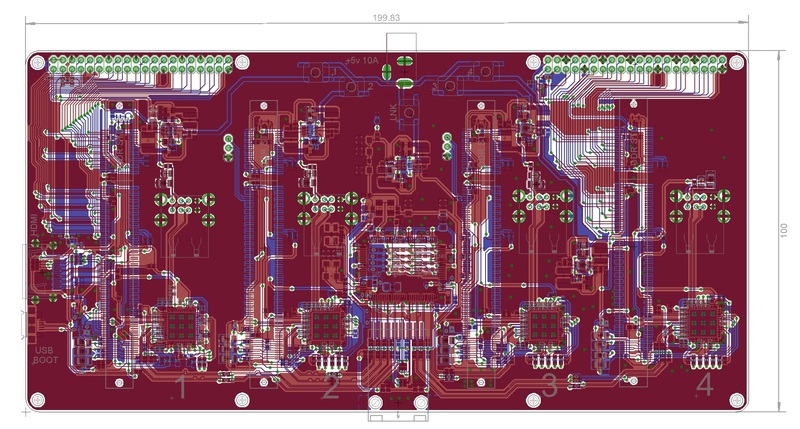 For this design as noted by the title is indeed a multi server based board that is designed to hold 4 Compute Modules together with the LAN9512 to have USB and Ethernet per Module. This board is not intended for Cluster work( but can be used that way), It was intended for the general public to have the ability to have 4 separate servers on a single board connected via a single network port and a single power point to power all 4 units at once. It was designed that way so that you do not need to buy extra parts or a network switch to get the same outcome. And lastly the technical bits you have all been waiting for!, for configuring new CMs I have included HDMI and USB Boot functionality to one of the Modules so that you can configure fresh CMs without the need of any other tools. The whole board will run at 5 Volts but at 10 Amps (due to 4 CMs being on the one board). There is a 5 Port 100Mb Switch on the same board so that all 4 CMs can get network connectivity without the need of an extra switch, which solves the problem alot of people have when they have more than one Pi. Size will be 200x100mm which should be an ideal size. Note: I am not an engineer in any shape or form(this is a side hobby) so please let me know if I have missed anything important in the schematic or board. I want one already ! Why use a two layer board? This sort of circuitry requires good signal integrity for the high speed signals and a low impedance (low for high frequency) power distribution network. Such a board will probably radiate to much and be too susceptible for exteranal noise sources. I would at least use a 4 layer board, you can use the internal planes for low impedance power distribution, shielding/cancelation and return path. Use a thin pre-preg between the internal layer and the top layer so you can easy design the right controlled impedance traces for USB, HDMI and Ethernet. This will greatly benefit signal integrity and give much better EMC behaviour, at only little extra cost. amk wrote: Why use a two layer board? This sort of circuitry requires good signal integrity for the high speed signals and a low impedance (low for high frequency) power distribution network. Such a board will probably radiate to much and be too susceptible for exteranal noise sources. I would at least use a 4 layer board, you can use the internal planes for low impedance power distribution, shielding/cancelation and return path. Use a thin pre-preg between the internal layer and the top layer so you can easy design the right controlled impedance traces for USB, HDMI and Ethernet. This will greatly benefit signal integrity and give much better EMC behaviour, at only little extra cost. Thanks for the link RaTTuS, if you have any schematics on it would be great but I will definitely look into that and see if I can get that or something similar. Ok So i have had a look at the Switch IC you have posted RaTTuS and while it is great i'm afraid that i can't use it at the moment. I will stick with the Original Realtek chipset for at least the initial Prototype as i have it setup and will think about switching to a Gbit Switch IC once I have confirmed the prototype works , I will need to see if i can get the schematics for a Gbit switch IC from Realtek as it appears they are the only ones i have found that do a 5 port gbit switch IC. amk wrote: Why use a two layer board? I read the posts on the Compute Module Test Board, and I'm wondering what would *actually* happen if you had stayed with a two layer design? I'm designing a compute module board that's 80mm x 100mm, has no LAN chip, and also has the host USB connector on the other side of the board (for logistic reasons). The pair of traces from the compute module to the USB switch chip are about 80mm long. I've routed them as 12 mils wide and 18 mils apart with 20 mil spacing to the ground planes on the sides. I understand the "matched length 90R differential pair" requirement. It's reasonable, justifiable, and *expensive*. CAD tools to do 4-layer work are often hundreds or thousands of dollars more. Prototype 4-layer PC boards are at least triple the cost of 2-layer boards from my favorite fab lab. I do my best to ensure the ground planes on my top/bottom combined signal/ground plane design is as contiguous and non-loopy as possible. I'm generous with top-to-bottom ground vias, I go over all auto-routed traces and make them 'islands' in the ground copper and without pointy edges. Previous projects I've done using high-frequency AC lines have never shown many problems. My question is... "Why not use a two layer board?" If I ignore all the warnings and paranoia, what might I expect? Calculations show that my expected impedance on the pair is about 88 ohms Z(odd), 176 ohms Z(differential). Assuming that the electricity on this low-voltage PC board is going only about half the speed of light, and that 80mm trace length is within the 100 picosecond requirement for USB 2.0, that this board is run inside a Faraday cage and a negligible amount of other EMF radiation is present... what? Will it work at all? The higher impedance melts the signal to zero? Diminished USB performance? Cold fusion detonation? International communism? It seems to me that the signal impedance match and ground impedance mismatch will result in a mildly distorted waveform but will still work... especially at a mere Full Speed (USB v1.1) connection. Any thoughts? I know this is a reeally sloppy question, but I thought maybe I could get a little more insight from the forum. I'm guessing the best answer to this is, "Give it a shot!" This won't be the final design, I fully expect to go to 4-layer for final production... *if necessary*. It might not be needed. Developing RF speed PCBs requires some trial and error, and I'm prepared for that, but I'm also keen on saving a bit of coin whenever possible. Thank you kindly for your consideration. PS> extra special bonus points for Michigan State alumni, as the University of Michigan electrical engineers I've asked about this were clueless. The main problems you'd experience when going to final production would be issues getting it through EMC testing... The two layer board will have no ground plane for the USB signals and therefore you'll likely have a return path for the USB ground currents that is not directly underneath the USB traces. This means it'll generate noise (which you'll see at 960MHz in the chamber), not sure how much noise but that'll be your main issue. I had a look at doing a 2 layer board for the Test board. But after some investigation I had found that the traces for USB and Ethernet would be relativity large for the space I had allocated for it, therefore and after reading documentation about how to get the 90/100 ohm differential pair they had suggested to use a 4 layer board with the GND layer as close as possible to the signals. Beautiful... this is completely acceptable for my purposes. Thank you kindly for the responses. Ouch, I'll have to upgrade my Tektronix 475. Yes, I noticed that you got great results with a 0.2mm pre-preg layer. Seems kinda obvious now... use a 62mil dialectric, you need 50 - 60 mil traces Every day I am so much less blind as to make ridiculous the coat hangers I used as welding rods the day before. I won't hijack your thread any further, thank you again. Looking forward to your posts, Briarios! Ok Just to provide an update. I have sent my designs off to get a quote from a Fab house in China. So i am waiting on a reply, As they have a labour day long weekend this weekend I probably won't hear from them till at least Tuesday. Sorry for the pictures the lighting was behind me and I didn't have another light source. just a small update. I am waiting on key tools to build this board. I had hoped they would show up last week but nothing yet. Just to let you know I have all the parts and PCB's just now waiting on some tools to get this Prototype up and running. I have finally managed to put all the parts together, and unfortunately I don't have the steady hands needed for SMD soldering/re flow so there are lot of solder bridges that i can't seem to clear. here are 2 pictures of the finished board anyway so you can see on what my idea is about. At the moment I would assume that this board is not functional due to the amount of solder bridges. I will track down a company in Perth who may have the steady hands needed for this project. A quick way of removing solder bridges is to use "desoldering braid" or "solder wick" which is braided copper wire. I use it all the time. What was useful to me was a fine pencil, with a well sharpened point. Graphite and solder aren't very friendly to one another. You can usually just push away the excess solder. And cleaning the flux off will also clean the solder balls left over from this process. A visual inspection is still needed tho. And I need a good magnifying glass to do that.